The AEPA practice test advice below is by real teachers who passed. It’s based on our 10+ years of experience preparing/passing this exam ourselves. Plus, what we discovered in mentoring thousands teacher candidates pass the AEPA test. Use the following test prep outline as you choose and read your AEPA study guide. The short stop for coffee became longer as I chatted with the young woman next to me in line. When we realized we were both teachers, we sat together. Kaylee was bright, energetic, and excited to begin her career. It was easy to see that she would be a great kindergarten teacher. She failed two the Arizona Educator Proficiency Assessments twice, each time thinking she knew the material. Each time, she was sure she had passed. Failure was a complete surprise. If Kaylee were the only one to fail the AEPA test, it would be sad for her. The cost of waiting to take the test again instead of starting a teaching career is difficult. The cost of taking the tests again is not fair. The stress of taking the high-stakes tests and the feeling of being a failure is heart-breaking. But Kaylee is not the only person who’s AEPA study guides failed her. She’s also not the only one who will not pass on the first—or second—attempt. There are many reasons candidates may fail on the first attempt at any of the AEPA exams. The following AEPA test preparation resources and cheat-sheets provide insights and tactics that help you pass the Arizona Educator Proficiency Assessments quicker and in less time. Passing college courses should prove you know the AEPA material. If you are already a successful teacher, and you are looking to add to your certificate, you should be able to pass. And many candidates go boldly into the test center only to find that they studied the wrong material or they spent too much time on the test re-reading hard questions, leaving them pressured to quickly finish the rest of the questions on the test. The Institute of Education Science says that “forgetting is a reality of life.” So what can we do to gain confidence that we will remember the material we study? Research shows that the use of “spaced” learning and “strategic use of quizzing” can help us remember material we learned last month or last year. How Can I Pass the AEPA the First Time? With the rise of accountability came high stakes tests, and with them came research on the best ways to improve tests scores. You may not be aware of the large amount of research that has been done on the use of practice tests for learners. The National Center for Education Research reviewed the large amount of research. Not all of the research was done on K-12 students: over 30 of the studies reviewed were done using college students like you. Take advantage of the research! 1. AEPA practice tests are some of the most effective ways to improve test scores. Researchers found having students “take a test” is always more potent as a “test content learning device” than having students do “book studying” of the target material. (https://ies.ed.gov/ncee/wwc/Docs/PracticeGuide/ 20072004.pdf). 2. AEPA practice questions not only improve recall, but they can reduce your test anxiety. A recent Tufts University study on stress and memory showed that in test-taking, “. . .it is not necessarily a matter of how much or how long someone studies, but how they study” (https://now.tufts.edu/news-releases/ practice-testing-protects-memory-against-stress). The results of that research show that “learning by taking practice tests, a strategy known as “retrieval practice,” can protect memory against the negative effects of stress.” The test compared practice tests with re-reading material for memorization. Those using the re-reading and memorizing strategy “remembered fewer items overall, particularly after stress.” And for some of us, just entering the test center is stressful! How Do I Choose The Best AEPA Practice Materials…(That’ll Actually Help Me Pass)? Check out the framework of your exams at www.aepa.nesinc site. Knowing the percentage of types of AEPA questions and the scoring for the exams can be helpful as you choose preparation materials. But that is only the beginning. 2. Choose a AEPA sample test that has more than one full length practice test. This way you can maximize the effectiveness of employing AEPA practice tests in your test prep program. The more AEPA exam practice you get, the more you you master the measured competencies of this test, lessen stress, improve your test taking skills and thereby your score. 4. The AEPA review questions, should have clear explanations for both correct and incorrect answers are given, so you learn how to take the test. 1. The AEPA practice test must be current. This can be difficult because the tests undergo revision. 2. Your practice test for the AEPA must contain information that may be on the actual exam. That way you can find your strengths so you can focus on your weak areas when you study. 3. The AEPA exam practice in your prep book must have the same format as the actual test. Some materials may ask questions that are not as difficult as the bonafide AEPA test. Also, some candidates complained that the study material had not been edited or proofread. Do you trust information from a source that has glaring errors? 4. The answer pages must explain reasons a certain answer is correct and why each of the other answers are incorrect. 5. Your AEPA practice questions must cover key words and phrasing of the test.. Many former AEPA test takers have state having test questions that represented the structure and wording as the actual test was central to passing the test! 1. Use many short practice sessions and take some time between them. Don’t cram for days. Doing this allows your long-term memory to store information. 2. Taking one full-length practice exam worked better than taking two or more full-length tests if the tests were taken in a short time frame. Again, extend the time between practice tests. 3. One full-length practice test taken between 1 and 6 days before the final test had the most impact. So save one of the tests for this time period. Make sure you have more than one practice test available. As you take your AEPA practice exam questions, place a star by the questions that take a longer time. Later, find what those questions have in common. Was it the material you did not know or was it the wording or phrasing that confused you? Analyze the answers, even if you chose the correct answer: look for patterns in AEPA test questions and answers to find the words, phrases, or types of questions that “trick” you. Dig deeper to find out why you chose the right and wrong answers for the questions! The best AEPA practice test or practice questions will be as close to the actual exam as possible. The most effective AEPA test practice requires realistic exam questions that simulate the wording, typical question and answer format and structure of real test. Any AEPA study guide (that’s not a waste of your time) will have an “exam-like” practice test or at least a lot of high quality sample questions. Unfortunately, most AEPA practice test questions don’t provide powerful tactics to get the correct answer when you aren’t sure which answer is correct. The typical AEPA book isn’t written by Arizona teachers who passed this exam. So don’t expect your run of the mill practice test for the AEPA to provide effective methods to get the correct answers when you aren’t sure of the right response. (official framework) and you’ll magically pass. Use “best AEPA practices” when preparing for your exam. That is, proven review and test taking methods used by previous Arizona Educator Proficiency Assessments test takers who really passed this thing. The habits you develop in taking AEPA practice questions will become automatic once you’re in the real testing center. Before taking a set of practice questions, take a few minutes to review the entire test. You’ll certainly find some of the questions easier than others. Do those straight away. It will make you feel a bit better and give you more time for the tough questions. And if you find yourself getting stuck on a question, make a mark, leave it and move on. Come back to it at the end when you’ll have more time, more focus and less panic. Not only will you have more time to clearly think through and evaluate the test question and answer choices of your toughest exam questions, often you’ll find the correct answer you’re looking for revealed in another test question or select response answer! Yes, you heard about the “process of elimination” many times before. However, I doubt you’re using it to extract-out the most points possible on your test. You must absolutely use this approach to any multiple choice question. Then use the more advanced methods listed below for using the process of elimination to get even more trick questions correct and pass-the-AEPA. There will usually be two AEPA questions that are you know are not likely to be the correct answer. Knock them out quick. You’ll then have 2 answers remaining. One that’s the right answer and the other will be semi-correct and semi-wrong. It’s the exam’s way to assess whether you really know the concept or “best practice” and can apply it to a classroom or merely are familiar with the term or just a general idea. Even if you can’t sort out the “most correct” answer from the “less correct” answer, you just went from a complete random chance of getting those impossible questions you weren’t sure of to a 50% chance of getting maximum points for that question. One way to pick the bad answer choices from the good is to look at the wording of the answers. The examiners generally prefer the correct answer to be wishy-washy. Any answer choice that uses words like “all”, “never” or “always” are probably wrong. Similarly, on math questions, the highest and lowest figures are usually bad choices too. Take them out. This expands on the “process of elimination” above. Another way to home in on the right answer choices is to pick out any answers that look the same. Usually on the AEPA exam, two answers will be extreme, one will look right and one will be right. The one that looks right has been put there deliberately to confuse you. The limited time you have to take this timed test means the exam room isn’t the place to start employing these test prep strategies. 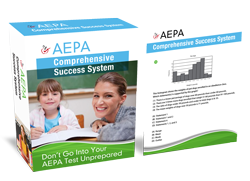 Develop these AEPA test taking skills weeks before your test day. Take AEPA practice tests using these simple, but highly effective methods to attack exam questions and extract the correct answer. By the time you walk into the exam and take the test, using more productive AEPA test taking methods will be automatic. You won’t be burning your mental energy during the exam thinking of all steps required to attack AEPA questions and get the right answer. You’ll be focused on guaranteeing you pass the AEPA test and put this exam behind you forever. One of the great things about long exams like the AEPA is that the answer to one question can often be found in another part of the paper. It’s going to be almost impossible for the examiners not to repeat a subject or duplicate a point. If you’re scratching your head over a question, move on and keep an eye out for it later on. There’s a good chance that they’ll give the game away in a different question. Candidates for Arizona teacher certification take at least two tests, one in professional knowledge and the other in specific subject area knowledge. Tests are offered for Early Childhood (Birth to Grade 3 or age 8); elementary education grades 1-8; secondary education grades 6-12; and middle school subject area exams aimed specifically to certify teachers for grades 6-8 subjects (this is not a substitute for the secondary education test). Arts education, special education and disabilities areas, reading endorsements, library media specialist tests and administrator exams are also offered. The state of Arizona also requires teachers to have knowledge of the Constitutions of the United States and Arizona. Teachers may choose to fulfill this requirement by taking an AEPA exam. Exam costs vary: though most AEPA tests require a $95 fee, some are $120 and Early Childhood Professional Knowledge tests and Administrator tests are $130-$170. The length of time for exams varies also. The typical test ranges from 2 ½ to 4 hours, but be prepared for up to 5 hours for math certification. Remember that there are at least two AEPA tests required, one of professional knowledge and one of pedagogical, or teaching knowledge. If you choose to take a third exam to fulfill the requirement for the Arizona and US Constitutions, the cost can be $300-$400. That does not count the time involved! It is important to be well-prepared to pass these exams the first time. The number of AEPA questions ranges from 100-150. The tests of Professional Knowledge and tests for foreign language teachers, principals, and superintendents include written assessments as well. AEPA tests are pass/fail. Raw score points are converted to a scale of 100-300, with scores of 220-240 typically considered passing scores. The AEPA exams are called high-stakes tests for a reason: realizing your dream of becoming a teacher rests on passing your Arizona Educator Proficiency Assessments. Use the best AEPA practice test research available to make the best use of your time and energy. You’ll find investment in the right AEPA study guide and taking AEPA practice tests pays-off once you get hired and have a classroom of your own…And that’s a lot better than failing this exam and working at low paying job you hate outside the field of education. Use top notch AEPA practice test questions developed by Arizona teachers who passed. Start practicing these techniques immediately in your study guides. Once you master these test prep methods with AEPA practice questions, you can apply it to the real exam and raise your score to passing-level. Those are just five simple AEPA exam practice tactics you can use to ace your Arizona teacher certification exam. There are many other ingredients and methods required to get a passing score. And you’ll need them all to put yourself in the classroom and in front of the blackboard. It actually covers the real AEPA! FREE AEPA practice questions (just like the exam). By AZ licensed teachers who passed. Get FREE AEPA Study Guide Now!